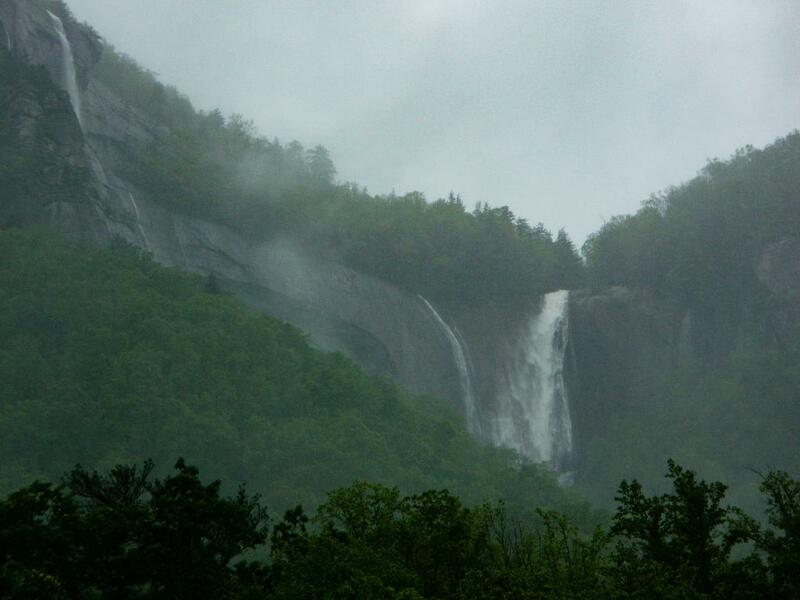 One of the tallest waterfalls in the state, Hickory Nut Falls is quite impressive, especially after some good rains. The creek can slow to a fast trickle in dry weather, but it never dries up. Flowing down a massive cliff face out of a forest high above, the falls is a very steep cascade, becoming nearly vertical and free-falling in sections closer to the bottom. The very bottom spreads out a bit over cracks and ledges, becoming photogenic just before it drops into a small, flat pool. The stream then runs level for a short distance around huge boulders before dropping over another series of cascades. Just how high is the falls? The official height of 404 feet that the park publishes must include the lower cascades (which you can't really see from the trail), because the upper portion is not nearly that high. Perhaps a more accurate figure is found on Wikipedia and in Kevin Adams' book, North Carolina Waterfalls, where he claims "someone" measured the falls with a string to arrive at a figure of 351 feet. This corroborates exactly with very old reports (circa 1859) of 350 feet, and also with modern satellite and National Elevation Dataset measurements, so I believe 351 is the correct value. From Asheville, take I-240 East to US 74A East. Follow this for approximately 25 miles to the entrance for Chimney Rock State Park in the town of Chimney Rock, on the right. Take the park road to the entrance gate and pay the entrance fee. You'll receive a map from the attendant. For a longer, steeper hike, park just ahead in the Meadows area. For a shorter, more level hike, park in the upper lot. This waterfall can also be viewed from afar along US 64 a bit west of the entrance to the park. Note: the falls is within Chimney Rock park. A fee is charged for access. Visit the park's web site or give them a call for current rates, which do vary by season. You'll get a map once you pay the fee and enter the park. For the shortest, most direct hike, park in the upper lot and follow the Hickory Nut Falls trail - a mostly smooth old road bed which climbs gently - to the base of the falls. For a longer hike, park in the Meadows parking area and take the Four Seasons trail - a moderately rough trail with some bridges, steps, and steep climbs - up to the Hickory Nut Falls trail and turn right. Continue on this trail - a wider, smoother old road with gentler grades - to the base of the falls.